Total Ground +14 storey building in 1.32acres of land and almost 80% is the open space. The unique speciality of this project is roof top swimming pool on 14th floor which connects the two towers. We have 2bhk, 3bhk and 3/4bhk duplex flats in it. 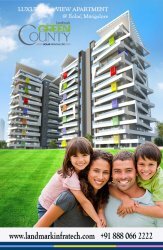 Hi-luxury apartments in affordable price that is only at 3700/sqft.